CINCINNATI — If you spend any time with April Martin and Paul Hill you get the sense they have worked together a long time. They pick up threads of conversation seamlessly, banter, and most notably, share a conviction for social justice. It’s the last bit that brought them together to make " Cincinnati Goddamn ," a documentary about the 15 police shootings of young black men from 1995-2001. “I’ve been fortunate to work on a number of social justice pieces,” Hill said. He has spent the past 20 years at Ohio State University’s Wexner Center for the Arts and serves as the Art and Technology studio manager there. Martin, a self-described activist, grew up in Glendale. She was a production assistant at WCPO in 2001, when riots broke out in Cincinnati following the shooting death of Timothy Thomas by a Cincinnati Police officer. That event changed the course of her life, as she hopes "Cincinnati Goddamn" does the lives of others. While the film focuses on a time period that ended 15 years ago, the themes apply today, Martin said. Martin and Hill point to the Black Lives Matter movement, which began after the acquittal of George Zimmerman after he shot and killed 17-year-old Trayvon Martin in Florida in 2012. Violence against black men in Ferguson, Missouri and in Baltimore in the past two years reinforced the movement. Last Tuesday,"Cincinnati Goddamn"was screened at the New Prospect Baptist Church on Summit Road as part of the week-long Violence as a Health Issue conference. “People’s response was great,” Martin said. “It felt like a healing space. People were able to voice their anger and their disgust. So many people had no idea what was really going on. “I’m really honored to have made this film and really grateful for the support of the people over the years,” she said. The film focuses mostly on the killings of Thomas and Roger Owensby Jr., an unarmed African-American man who died in a police cruiser in 2000 after running from police and ending up in a struggle with them, and the subsequent trials of the officers who killed them. Both Hill and Martin become animated when discussing the film – there are no tears, but there is outrage and determination in their voices and body language. “It’s institutionalized racism,” Martin added. She said her interactions with the Owensby family were the most eye-opening part of the experience for her. “It’s important to look at who’s being targeted and who’s being disenfranchised, who is continually being oppressed, and you look at who benefits from it,” Hill said. 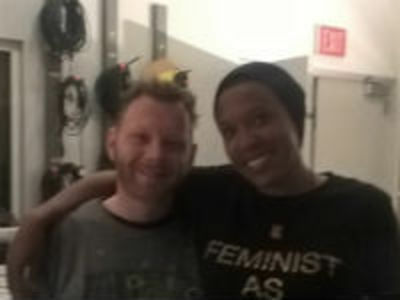 The film took nine years to complete, during which Martin and Hill formed a friendship and partnership. That continues today, as they promote "Cincinnati Goddamn." Martin arrived at Wexner with a four-hour-long film, although the final version is 102 minutes. “Wexner is a womb of creativity,” she said. Still, the arduous process took its toll. In 2013, Martin moved to Oakland, California, with the final cuts still unfinished, trusting Hill to complete the film. “I had to learn to let go,” she said. 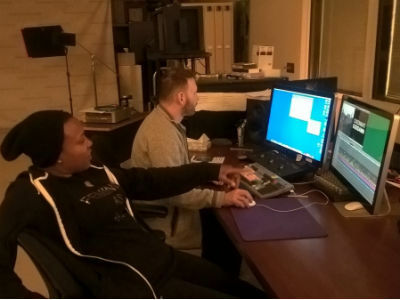 April Martin and Paul Hill, shown here editing film, had to whittle down their documentary "Cincinnati Goddamn" from four hours to 102 minutes. Martin is now splitting her time between Ohio and Oakland. Martin and Hill know that the work isn’t done. “The big missing piece is seeing each other’s humanity,” Martin said. “That’s what is really at the core of all this,” Hill agreed. “Seeing the response to this film has made it all worthwhile,” Martin said, with a smile that contained a full spectrum of emotion.